Welschnofen/Nova Levante lies at 1,182 m of altitude, roughly 20 km east of Bolzano, surrounded by the most beautiful mountains in the world, the Dolomites with Rosengarten and Latemar, in the UNESCO world natural heritage site. Holiday-makers in Welschnofen in the summer can choose from an enormous range of different activities: golf, hiking, climbing, mountain-biking, horse-riding, paragliding, trekking with lama e alpaca, Latemarium, swimming in a heated outdoor pool ... and all against the fantastic backdrop provided by the peaks and crags of Rosengarten and Latemar! Winters in Welschnofen are also jam-packed with many different activities. Two ski areas are located in the immediate vicinity, the Ski Area Carezza-Karersee and the Ski Centre Latemar-Obereggen. The area also boasts cross-country ski trails and several toboggan runs. And, of course, many attractive routes for snow shoe touring and winter hikes. You will eat and drink well in Welschnofen as well, and the town also offers attractive opportunities for some shopping. The new, environmentally-friendly gondola lift starts just approx. 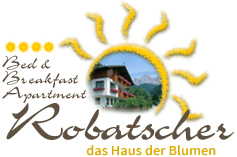 300 metres away from our house, bringing you directly into Rosengarten Latemar - Carezza - a haven for both skiers and hikers. Le Corbusier once called the Dolomites "the world's finest example of natural architecture". In fact, the natural spectacle which takes place every day at sunset when the peaks of the Rosengarten glow with an intense red colour and the village of Welschnofen is enveloped in an atmosphere of magic, is beyond compare. On Friday, 26th June 2009, the Dolomites were placed on the prestigious list of Natural World Heritage Sites. The decision was made by UNESCO at its annual world congress. UNESCO was enchanted by the beauty of the Dolomites: pointed spires, jagged summits and glorious colors that change throughout the day. At sunset the Dolomites turn a fiery red, then change to violet before disappearing into the night. This is the “Enrosadira” – a phenomenon caused by the unusual chemical composition of dolomite – a natural spectacle that is beyond compare.